Simon & Schuster, 9781476713489, 224pp. This charming and whimsically illustrated book of newly minted words—on politics and the media, love and friendship, work, play, family, fashion, and city life—presents a necessary vocabulary for the ever-changing customs of the young millennium. If you’ve escaped binary confinement and find yourself rushing cell-mell to a clusterfete— slurpwalking as you commutikaze—then who are you? You are a typical citizen of the young millennium, caught up in the fast-paced megatasking socio-professional whirl of our ever-evolving digitally-enhanced lives. If you’ve ever wondered what to call it when you answer the TV remote instead of the phone, or wished you had a phrase to capture your supervisor’s stealth campaign to stall your career, here is your guide. Now you can say “Oops, droidian slip!” with ease, and call out your boss for the impedimentor that he is. Armed with Wordbirds, you will be able to skillfully talk your way into, or out of, any situation the twenty-first century throws at you. With 150 gorgeous, Audubony, highly expressive bird illustrations, these neologisms will have you crowing with delight, and show you that fine feathers make fine words. Why birds, you may ask? Hadn’t you heard? The bird is the word. Now stop deliberotting and open this book! Liesl Schillinger has written for many publications, including The New York Times, The New Yorker, The Washington Post, and The New Republic. She is a regular contributor to The New York Times Book Review and translates fiction from French and German. Elizabeth Zechel is the illustrator and author of the children’s book Is There a Mouse in the Baby’s Room? She has created illustrations for children’s books and cookbooks, as well as for a variety of magazine and literary journals. She lives in Brooklyn. Literary catnip for bird lovers who also find themselves fascinated – or annoyed – by the quirks of modern life. Schillinger demonstrates a keen talent for zooming in on expressions missing from our vocabulary....[she has] streamlined our language, fast-tracked awkward situations, and refined the humor of word play....You will want to share these clever coinages with your friends, and many of these words may even make it into our expanding collective lexicon. Wordbirds is a rare thing: A gift book that's fun, nicely packaged and truly worth reading. "I am so into "Wordbirds", that from now on, I am going to use these words when playing Scrabble. If anyone challenges me, I will immediately throw the entire board game in the air. And I will say: 'that's for Liesl Schillinger.'" A great gift for pun lovers and playful linguists. If your friend complains when you blunderschedule, try not to apologibe in response. 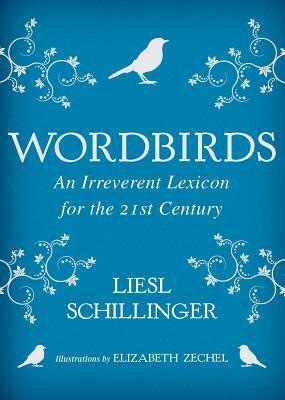 Liesl Schillinger's witty collection of necessary new words -- with charming avian illustrations from Elizabeth Zechel --will have you on a jollyroll.